Enjoy the benefits of high-efficiency LED light bulbs without giving up the old-fashioned classic look from the 19th century. Compatible with LED dimmer switches*, offering a smooth dimming control with the lowest brightness at 10%. *Make sure to check with your dimmer, not all dimmers are designed to work with LED light bulbs. Estimated energy cost is $0.48 per bulb per year*, which consumes 85% less energy and lasts up to 20 times longer than incandescent bulbs. *Based on 3 hrs/day, 11¢/kWh. Full brightness immediately when powered on and illuminates light equivalent to 40-Watt incandescent bulbs while only consuming 4W of power. Non-flickering light and zero harsh glares helps you avoid eye fatigue and provides you with a comfortable, stress-free atmosphere. 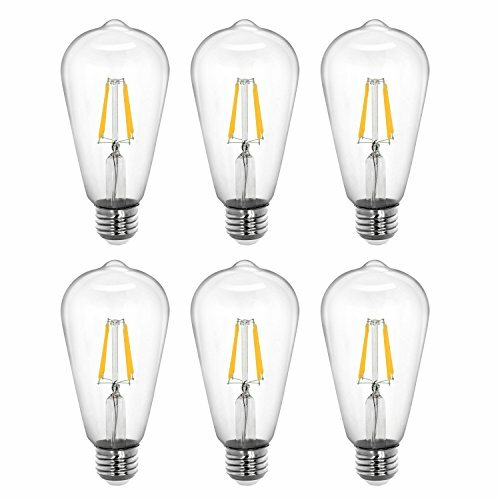 VINTAGE DESIGN - Tenergy 6-Pack dimmable LED edison bulbs, Antique Vintage Style ST64 light bulbs designed to revive the beautiful classic home decor styles of the 19th century. A combination of vintage elegance and modern technology. DIMMABLE - These decorative bulbs are compatible with LED dimmer switch, dimmable down to 10% brightness, offering smooth dimming control. *Make sure to check with your dimmer, not all dimmers are designed to work with dimmable LED light bulbs. ENERGY EFFICIENT - 4W LED vintage light bulbs will light up immediately when powered on, provide perfect illumination equivalent to 40-Watt incandescent bulbs but only consumes 4W power. SUPERIOR QUALITY - Non-flickering light and zero harsh glares help you avoid eye fatigue and provide you with a comfortable, stress-free atmosphere. These warm white LED bulbs are ideal for homes, restaurants, coffee bars, retail shops, hotels, and many more. UL CERTIFIED & 3 YEARS WARRANTY - Built with premium materials and circuitry, Tenergy antique LED bulbs are certified by the rigorous safety standards of Underwriters Laboratories. Eco-friendly light bulbs that contain no breakable parts and free of toxic chemicals, safe for your family and the environment. Long service life with a special 3 year warranty.